Why two model numbers TN115 vs TN110 for brother laser toner cartridges? Both TN 115 and TN 110 fit the same printers so you can use either. The only real reason they have different product codes is the capacity of the toner cartridges are not the same. As is common with most manufacturers (including brother) they will offer normal and high capacity toner cartridges, in this case the TN-110 is the normal capacity cartridge and the TN-115 is the high capacity cartridge for your laser printer. 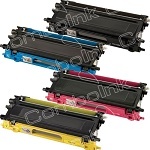 TN110BK will generally print 2500 pages from each black toner cartridge whilst cyan TN110C, magenta TN110M and yellow TN110Y print 1500 pages each. Price wise you are looking at US$220 – US$300 from the different sites we checked for all four toner colors. However a much better option would be to use TN 115 high capacity compatible toner cartridges for your laser printer, not only do most places guarantee the quality but you will save over 60% compared to buying genuine brother TN-155 cartridges. Click here to buy the price is fantastic at House Of Inks and you will save a huge amount compared to Brother originals. The TN 115 compatible costs less than the TN 110 genuine low capacity cartridges, that’s a great deal, less waste and more money in your pocket. Compatible laser toner cartridges have been used for a long time now and any concern of the quality of not using original brother cartridges are unfounded in our opinion, we have many of customers all over Australia and have are yet to have a cartridge returned due to low quality printing results which is usually the only reason people choose to pay so much more for original brother laser or inkjet cartridges.